My daughter rang to say that the toilet in her rented home is leaking water. Being a non plumber person but wanting to continue my daughters illusion that I can do anything. I ummed and arred, asked some plumbing sounding questions and told her that first I needed to pop over to assess the problem. Once I had seen what was going on I went home and hopped on the internet to find a fixing toilet tutorial. Firstly I needed to find out what the different parts were called and so googled toilet parts and looked at pictures and found out that the part I was looking at fixing was called the Flush Cone which is connected to the Flush Pipe. After that it was easy to find a tutorial on replacing a deteriorated flush cone with a new one. They only cost a few dollars too!! A plumber would have charged a few hundred dollars so my internet is paying for itself! Hooray! My sewing has been taken up with sewing simple things for friends, ball gowns for my sister and making a dress for my mother in law. The ball gown is a massive headache. I made it according to the size she said she was and at the "fitting" I found out she has put on just a tad more weight than her dress would have liked. So it doesn't fit and never will. 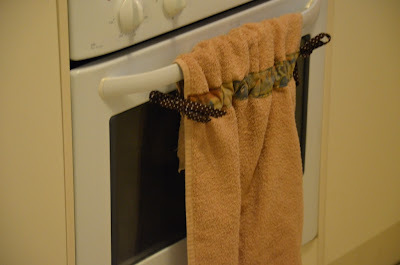 A friend who likes the kitchen hand towels I made for myself mentioned she would really love one that ties to the stove as her husband and kids always run off with her towels. I can't resist a good sob story so I made her one. Now her older daughter wants one and is currently thinking up her own sob story for me! I used a tutorial from Pin Sew Press to make this towel. It was very easy to follow and the towel was whipped up in no time. This photo is the best I could do due to the weather. For the past three or four months it has been dark and grey EVERYDAY except when I am stuck in an office at work. Then it is beautiful outside!!! The sun is on its way so my photo's should improve! Is that me you are referring to at the end of your post as that made me smile. I really have not had much time for catching up on blogs and was just about to head off to get my daughter ready for school and thought one more. Great read thanks. Love the bit about keeping up your daughter illusion....and well done on fixing the toilet. What a clever way to attach the towel to the stove.